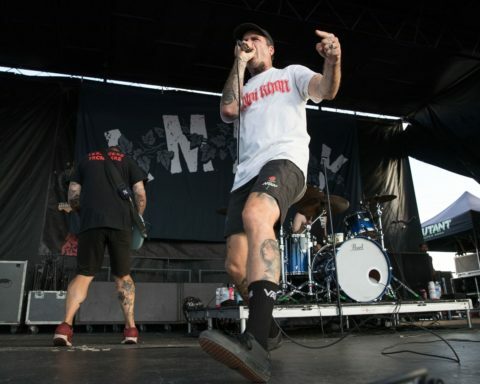 The Vans Warped Tour announced late last year that 2018 would be the final year of the cross-country tour. Yesterday, the tour made a stop at the MIDFLORIDA Credit Union Amphitheater at the Florida State Fairgrounds. The stop was the 2nd to the last date of the tour. The venue this year was different from previous years, where it was held at the Vinoy Park in St. Petersburg. 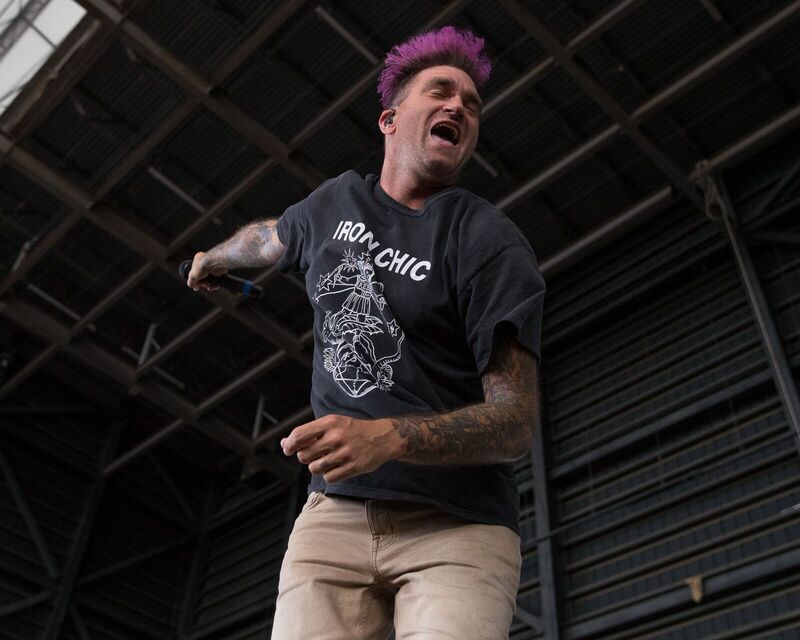 The announcement of 2018 being the final run of the Warped Tour resulted in many young fans going for the first time and nostalgic punk fans coming back for one last day, this included myself. 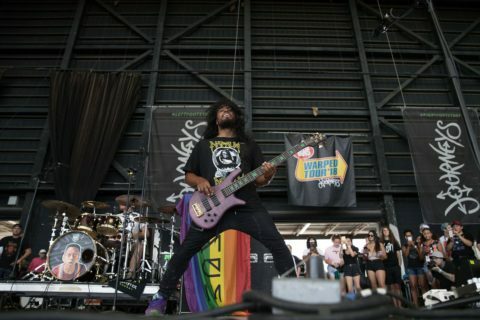 I attended the St. Pete Warped tour date every year from 2006 – 2012. Like many others, when I heard the news that Warped Tour was coming to an end, I knew I couldn’t pass up going one last time. 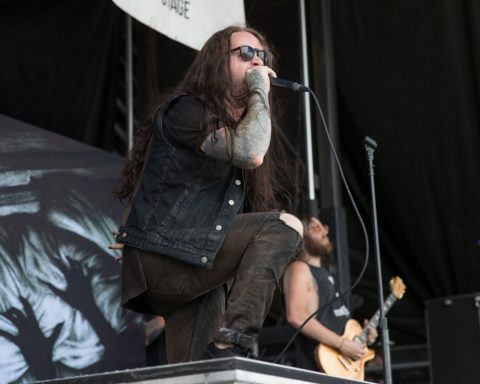 Metalcore Christian Band, MyChildren MyBride from Alabama, kicked off the day at the Mutant Red Dawn Stage. I got to the Fairgrounds about 30 minutes before doors opened and fans were already lined up. As soon as doors opened many rushed to the famous inflatable schedule located in the middle of the fairgrounds. At 11:30 am sharp, the first band kicked off the day. One aspect of Warped Tour that I always enjoyed is the opportunity they give to new and mostly unknown bands. When I first started going, there was the Kevin Says Stage, now there is the Full Sail Stage. There, I found Limbs, a local band from Tampa. They had the early 12:35 time slot, but that didn’t stop a crowd from packing the area around the stage. A nice benefit from this stop of the tour moving from Vinoy Park in St. Pete over to the Amphitheater is the seating and cover that provides protection from the sun. While there weren’t any weather interruptions, unlike the previous two Florida dates of this year’s tour. The lack of rain or even cloud cover resulted in no protection from the sun or the intensity of the heat. This led many to the shaded and seated area of the amphitheater, just In time for Issues. Less Than Jake, American ska punk band from Gainesville, Florida, perform on the main stage. Another thing that remained unchanged from the early years that I attended Warped Tour is the mix of ‘old school’ bands and newer bands. An hour after Issues performed, a band formed in 2012. 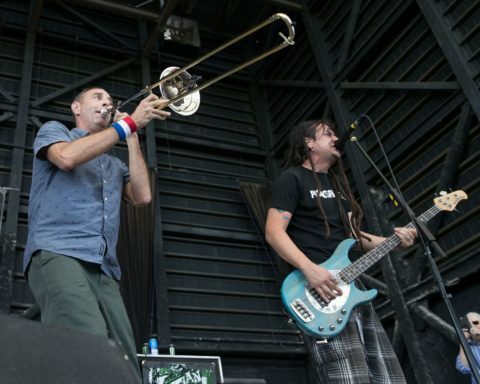 Less Than Jake, A Ska Punk band who first played the warped tour in 1997 took to the stage. 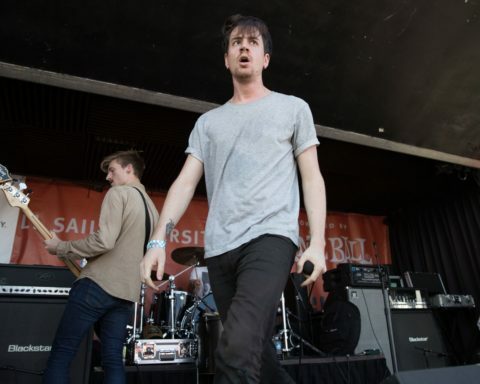 They mentioned that they have played more shows throughout the history of Warped Tour than any other band. 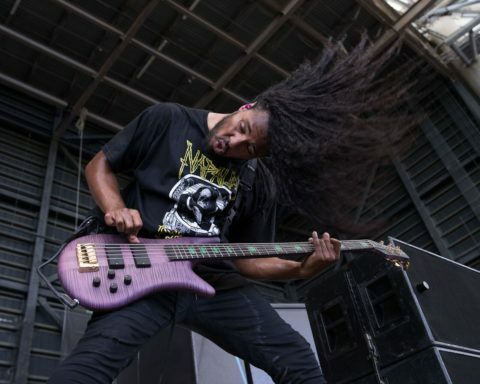 Keith Buckley From Every Time I Die. Every Time I Die, a Metal band from Buffalo that I saw on Warped the first year I went back in 2006, took to the Mutant White Lighting Stage at 5 pm with the biggest crowd of the day for that stage. The Amity Affliction closed out the Mutant Red Dawn Stage. As the day began to wind down, a couple bands that played the early years of the tour took to the main stages. 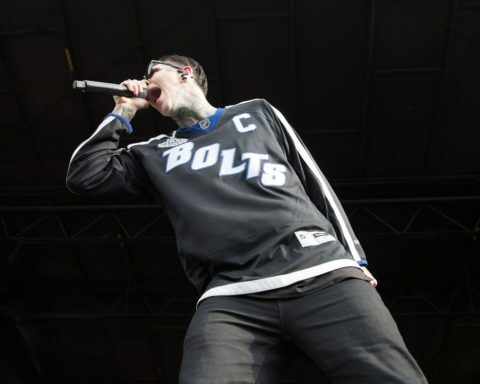 Chris Motionless, Frontman of Motionless In White, won the crowd over instantly by coming out with a Steven Stamkos Jersey. As it got close to 8 pm, I went over to the Mutant Stage where August Burns Red closed the show to a large crowd of diehard fans that waited till the end of the day to see them. 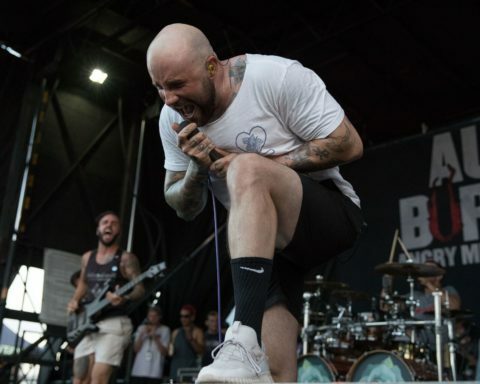 August Burns Red closed the Tampa date of the Warped Tour. Other than a venue change, not much else has was different from 12 years ago when I first went to Warped Tour. It will be surely be missed by everyone that went every Summer to see bands they grew up on, or who went to learn about new bands. 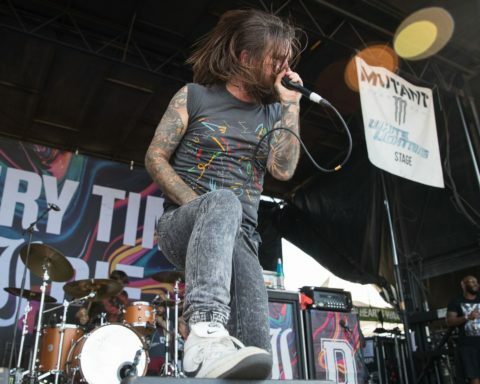 Sunday stop in West Palm Beach is the final date of the final Warped Tour. We would also like to personally thank Warped Tour’s founder Kevin Lyman for turning us on to new bands and providing us with the opportunity to make memories that we will cherish for the rest of our lives.